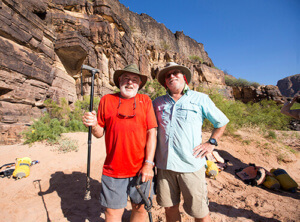 Bruce Campbell, left, with his friend Larry on the last day of their 8 Day Motor trip in the Grand Canyon. A Grand Canyon float has been on my bucket list for a long time. Finally fulfilled it with an eight day trip in late July 2016. Had a fantastic time. While I’m disabled, the staff including Jeff, Ted, Stacey, Tara, Dean and Andrew made sure that I got on and off the rafts and around camp without a problem. Jeff was great about briefing me on the hikes so that I could decide if I should attempt them. A friend who accompanied me and my fellow rafters were also a big help. The food was great and plentiful, never imagined that I would be eating fresh salads and cheese cake at the bottom of the Grand Canyon in 114 degrees! The weather was accommodating. In fact, we were under hot temperature advisories most of the trip. Made the cold water welcome but after a good dowsing, the sun was also welcome. Didn’t even bother setting up our tents after the first, the learning, night. Just set up our cots and slept under the full moon and stars. The shadows and lit canyon walls were eerie under the full moon and, after it set, the stars were amazing. Jeff and Ted were very knowledgeable about the canyon, pointing out geological features, historic sites and history of the Canyon. Their personalities complemented each other and their interactions were entertaining. I recommend this trip to all, especially those with limited abilities. Go for it and don’t look back! Grand Canyon Whitewater will accommodate you if they possibly can.